Anthony Prosper: [Gideon is aiming his rifle at him] Do your worst, brother. Gideon Prosper: That is the problem. You are my brother. 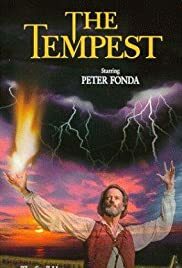 The (DVD)movie "The Tempest", directed by Jack Bender, was published in 2001. It didn't make its way to German cinemas and neither the director or an actor were able to receive an important award for this movie. The movie refers to the Shakespearean play "The Tempest" which was published at the end of the 16th century. The director tried to create an modern version of this play, but failed. At the beginning of the movie the plantation owner Prosper gets in a conflict with his brother Antonio about the treatment of their slaves. Antonio sets his brother a trip and tries to kill him but with the help of a witch, Prosper is able to escape and flees with his daughter and a slave called Ariel to a small island nearby the Mississippi river. For over twelve years he has lived isolated on this island, till a lucky chance enables him to take revenge on his brother....If Prosper will be lucky you have to find out by yourself.